An invoice is perhaps the simplest and most fundamental element to any business. Yet not every invoice is what it seems. The reality today is that face invoices are becoming an increasingly prominent procurement risk. 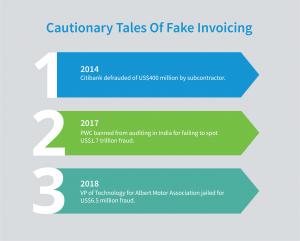 Fake invoicing can come in a variety of forms, from external fraudsters raising scam invoices to the unfortunate cases of employees seeking personal financial gain. The sophistication of such methods can vary from immaculately presented invoices to badly crafted purchase orders. And sometimes even the most experienced finance departments can be caught out. One of the more notorious cases of fake invoicing in recent years came from global finance giant Citigroup. Over a period of several years, a Mexican contractor exploited a complex and inefficient financing system through Citigroup’s subsidiary Banamex to the tune of US$400 million. That’s a significant financial and reputational loss for a company with over 200 years of financial experience. The case of Citigroup isn’t an isolated incident. Fake invoicing can even thrive in the eye of supposed financial scrutiny. Globally recognised accounting firm PWC was recently banned from auditing in India for a period of 2 years after failing to identify an invoice fraud of US$1.7billion that led to the demise of Indian IT services giant Satyam. Fake invoicing can also persist as an internal problem within a business. James Gladden, former VP of Technology at Canadian firm Alberta Motor Association, used his position to fake invoices and defraud his employer of almost US$6.5 million. He used his role and authorisation to raise and approve invoices for goods and services for the company’s IT department, ultimately funnelling the money into his own companies and accounts. What do these cases teach us about fake invoices? Each of these cases offers a unique lesson on the vulnerability to fake invoices and procurement risks. In the case of Citibank it was the disjointed nature of the financing and invoicing system that left the business vulnerable to fraud. With no overall oversight, and poor communication between the operational departments and those responsible for making payment, there was a significant, and unfortunately realised, opportunity for fraud. In any business it’s important to ensure that clear lines of communication and transparency around financing are maintained. That’s especially true in the case of complex, multi-layered organisations. The case of PWC offers a different angle to invoice fraud. As the auditors, PWC had a responsibility to carry out due diligence to verify the validity of the invoices which they received. From an external point of view it’s vital to qualify the veracity of an invoice. If you can’t confirm an invoice relates to work completed, or goods or services purchased, then undertake an investigation to ensure that invoice is genuine. In the case of employee fraud, appropriate approval pathways and oversight are essential to limit exposure to the risk of fake invoices. In an organisation with no clear oversight and limited approval requirements, there is always a risk that one untrustworthy individual will exploit vulnerabilities. If there is one theme which underlies these vulnerabilities it’s the need for transparency and clear business oversight. Utilising e-procurement solutions like Procurehere can offer a vital part of that puzzle. Our simple purchase approval pathways and clear approval systems put your business in control of who can raise purchase orders, and crucially who can approve them. The ability to implement a multi-layered approval process offers a further barrier to the realisation of fraud. Undertaking key events through e-procurement platforms can potentially offer another level of security to your payment processes. An easily referenced RFx or Auction on Procurehere’s cloud-based platform means you have the information at hand to understand and validate the invoices raised against the work undertaken. Most important of all is ensuring that your payment and invoicing pathways are easily referenced, and include appropriate approval layers. Where possible, ensure that people with intimate knowledge of projects or purchase orders are involved in the sign off process for approval. Ultimately, like many of the more acute procurement risks, the less transparency and business oversight we employ, the greater our vulnerability. The good news is, the harder we work to deliver better ways of operating, the less vulnerable we are to the problems of fake invoicing.